This post is about what you could do to celebrate trees around the Summer Solstice. Midsummer is a time for celebrations of fertility and green growth all over the world especially in Europe. We live in an area of South East London that used to be covered in fruit trees and which grew fruit and veg for the inner city. Telegraph Hill was then named Plowed Garlick Hill. Robert Browning, the poet, lived there for a time and described it as very green, rolling and pastoral. 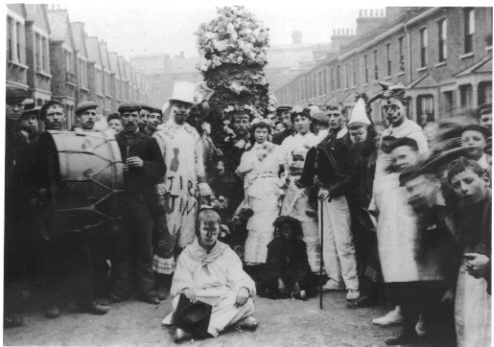 There are long traditions in the Deptford and New Cross area of Jack in the Green parades and two years ago we ‘rediscovered’ a particular tradition from Plowed Garlick Hill. Left over from its orchard-filled days, there are still lots of plum, cherry, apple and pear trees in the streets, in the park and the many long gardens, although I don’t know how many originate from the old seeds. (I like to imagine it’s lots of them.) Some of the prunus trees are being chopped down as they are infected with fungus, so combined with the cold spring, there has been a lot less blossom around. Also, there are many fewer bees around to pollinate the trees and flowers, due to the cold weather and impact of varroa mites and pesticides. As there are growing concerns about food prices and food security, it’s extra important that we give the fruit trees and gardens our blessings. We’re planning to do this with the Garlick Man parade on the Summer Solstice of 21st June. This will be in collaboration with Transition New Cross, New Cross Learning (the people’s library), Grow Wild (a local food and common space gardens project) and Bold Vision (which runs the community cafe, the Hill Station). 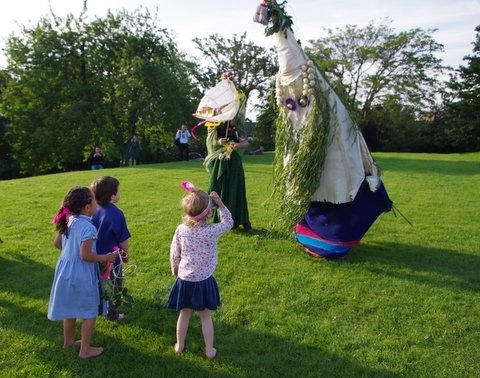 The parade will conclude in a wedding ceremony between Garlick Man of the Hill and the green woman of New Cross valley, and a picnic with garlic-inspired food cooked by Grow Wild. There will be making sessions in advance on the 15th June (Telegraph Hill community centre 12-4)) and 19th June (New Cross Learning 2-3), Making of silhouette shapes on sticks, seedbombs, tooters and hats. Artists of all kinds are very welcome to join. If you’d like to contribute any performances (poetry, song, dance, costumes, art related to trees or food, etc) or use the event to share information about a campaign or organisation, please let us know either on the Facebook event page or in comments below. If you can’t make SE14, then why not organise your own Solstice celebration of trees, fertility and local food? Please tell us what you plan if you intend to do your own thing.